This book is so touching, that honestly, it’s hard not to well up as I read it. I shared this book with my third graders for African-Am erican History Month in February. Love Twelve Miles Long is the story of young Frederick Douglass, whose mother travels 12 miles each weekend to see him. She works in the corn fields. Frederick works in the Big House. The story begins as she is about to leave to return to her work. She is tucking him in to sleep. Frederick asks her about her long walk back to her home. She tells him that each mile has a special meaning and helps make the journey shorter. The first mile is for forgetting, the second for remembering, the third for listening, the fourth for looking up, the fifth for wondering, the sixth is for praying, the seventh is for singing, the eighth is for smiling, the ninth is for giving thanks, the tenth is for hoping, the eleventh is for dreaming and the twelve is for love. Each mile is another expression of love for her son and hope that they will be able to live together as a family when they are free. Colin Bootman’s illustrations are beautiful and bring Armand’s text to life. My students study Frederick Douglass’ life and know that he learned to read, became a free man and a great leader. Now they have the opportunity to imagine his life as a child. There are so many incredible books to share during African-American History Month. This compelling book made a real impression on me and on my fourth graders. 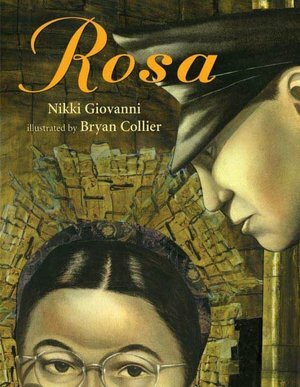 Rosa is a dramatic retelling of Rosa Parks’ story. It begins with Rosa going to work at her job as a seamstress in the alterations department. She is good spirits, and her supervisor has let her leave work early. When Rosa gets on the bus, she sits in the neutral section, the area where both blacks and whites can sit. As she sits, she thinking about the meal she’ll prepare for her husband that evening. Suddenly, she hears the bus driver yell, “I said give me those seats!”. This exclamation, coming after such a peaceful beginning to the story is a jolt, to the reader, to the listeners, and, you can imagine, to Mrs. Parks, daydreaming after a day’s work. The other black people in the neutral section slip back to the crowded black section of the bus, trying to avoid trouble. Mrs. Parks watches them go but decides that she will just sit. Nikki Giovanni wraps the story of Rosa Parks in the history of the time: the 1954 Supreme Court decision in Brown vs. the Board of Education that stated that separate was “inherently unequal” and the death of Emmet Till, a fourteen-year-old boy who was lynched in Mississippi, shortly after the Brown vs. the Board of Education ruling. It was these events and Mrs. Parks’ courageous action and arrest that led supporters band together with the Women’s Political Council, the NAACP and local churches. The people gathered selected Dr. Martin Luther King, Jr. as their spokesman. Together, they chose to stay off the buses of Montgomery. They walked in every kind of weather, at all times of day, every day. On November 13, 1956, a year after Rosa Parks’ arrest, the Supreme Court ruled that segregation on buses was also illegal. Giovanni’s retelling of this important moment in African-American history is presented with the incredible illustrations of Bryan Collier. This book won the Caldecott Honor in 2006. Please don’t miss this great book. African-American history month is over now; but, as a friend of mine correctly said, sharing the messages of this book is important all year long. I have some favorite books to read when celebrating Dr. Martin Luther King Jr.’s birthday and his tremendous life. One, is Martin’s Big Words, by Doreen Rappaport. Like me, most teachers love Martin’s Big Words as well. So finding something different but accessible to young audiences is a always a challenge for me in the library. Here is a book that I discovered this year that I love for younger audiences. Published in 2006, it provides a different perspective on this great man’s life that students haven’t heard before. 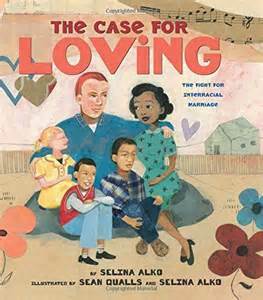 When I introduce this book to my students, I remind them that before Dr. King became “Dr. King”, he was a child just like them. 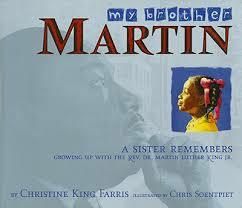 My Brother Martin was written by Christine King Farris, Dr. King’s older sister. In My Brother Martin, Ms. King Farris tells of Dr. King’s childhood on Auburn Street in Atlanta, Georgia. There are funny pranks that the children, Christine, M.L. (Martin Luther) and their younger brother A.D. (Alfred Daniel) played on neighbors and their piano teacher. These stories made all my students smile. Ms. King Farris also tells of the painful time when the children of a white store owner on their street were no longer allowed to play with Negroes (a word I had to explain to my younger students). The white family sold their store and moved away. After years of shielding their children from the injustice and cruelty dealt to black people, this episode brought all that home. Christine, M.L. and A.D. were confused about why their friends would no longer play with them. Their mother explained about all the “Whites Only” signs. She also told her children that this injustice was there, “Because they just don’t understand that everyone is the same, but someday, it will be better.” M.L. then replied, “Mother Dear, one day I’m going to turn this world upside down.” And that he did. M.L. and his sister and brother now were aware of segregation. They watched as their father, a minister at Ebenezer Baptist Church spoke out against it and how he practiced what he preached. Their father did not allow others to treat him differently because of his skin color and took his business elsewhere when store owners did. Their parents’ example and the pain of their childhood friends’ leaving provided the inspiration for Dr. King’s pursuit of justice. This is a heartening and inspiring story of Dr. King that provides insights other books don’t provide. I highly recommend it to elementary school audiences. The illustrations by Chris Soentpiet are wonderful. This book is a great read aloud for African-American history month. I plan to use it with my third and fourth graders. The illustrations by Gregory Christie are excellent. 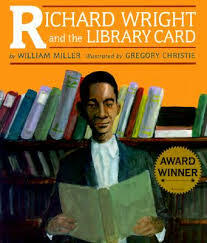 Richard Wright loved to read but had no access to books as a child or as a young man. He would read scraps of newspaper or whatever words he could find. When Richard finds work at an optician’s office, he notices that one of the white men there seems different – as he would understand Richard’s need for books. Richard gathers his courage and asks the man if he can use the man’s library card. When Richard goes to the public library. When the librarian questions him about the books he is checking out, Richard lies to her and tells her that he can’t read. He tells her that he is just picking up books for the card’s owner. White people in the library snicker at him. This is the fictionalized account of an important episode in Richard Wright’s life, written about in Wright’s famous autobiography, Black Boy, published in 1945. Highly recommended. 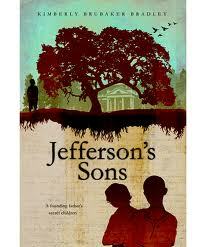 I love to read parts of this book aloud to my students during African-American history month. 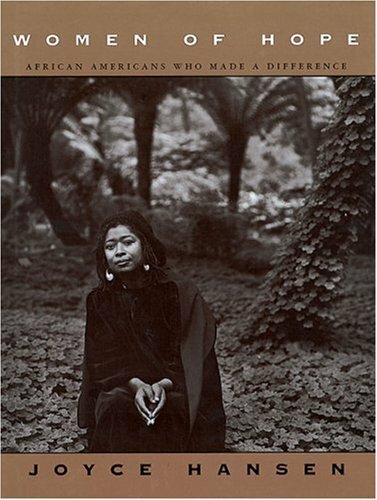 This book features quotes, black and white photographs and a page about many notable African-American women, including: Ida B. Wells-Barnett, The Delany Sisters, Septima Poinsette Clark, Ella Josephine Baker, Fannie Lou Hamer, Ruby Dee, Maya Angelou, Toni Morrison, Marian Wright Eledman, Alica Walker, Alexa Canady, Mae C. Jemison with a list of more notable women in the back of the book. This book makes a great resource for teachers or a wonderfully inspiring book for young people. Read a page here and there, or read the entire book. Either way, don’t miss it.